Rotuma is an island in Fiji. Although it lies approximately 465 km to the north of the Fiji Islands it is a Polynesian outlier with a culture more in common with Tonga and Samoa than Melanesian Fiji. It is a volcanic island of approximately 43 sq. km, with a few, much smaller, surrounding islands. The island has been politically part of Fiji since 1881. Because of their Polynesian appearance and distinctive language, Rotumans now constitute a recognizable minority group within Fiji. 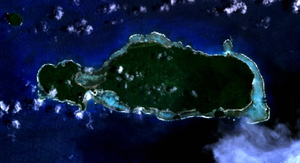 Rotuma’s population is 2,000 but far more Rotumans now live abroad (in Fiji, Australia, New Zealand, the United States and Europe) than live on the island. To date Rotuma's tourism potential remains largely untapped. Visitors have to arrange accommodation with families. There was one daily 3-hour flight on a fifteen-seat plane of Air Fiji, from Suva. However, the airline went out of business in June 2009. Fiji Airways (Pacific Sun) is Fiji majority owned and flies to Rotuma from Nadi. Flights can be cancelled when the grass airstrip at Rotuma is waterlogged. There is a monthly cargo ship from Suva but it does not follow a fixed schedule. It takes up to 100 passengers. There is a sandy coastal road. Villages are spread out along this road. The island also has walking tracks in the interior. There are some interesting archaeological sites such as the grave of the kings, at Sisilo. If you have plenty of time, Rotuma is a great place to experience the laid-back Polynesian lifestyle. There are excellent beaches, the best ones being on the south coast. Meals are provided by the families with whom you stay. The basic diet is taro, reef fish, and tinned meat. There are some small local shops but these can run out of supplies. Consider taking some of your favourite drink with you. This page was last edited on 10 March 2017, at 23:11.